After laying low and allowing the volcanic haze and clouds to build up for the last few days, the tradewinds returned today and blew it all back out to sea. All that sulfuric acid must have scrubbed the atmosphere clean, because the air was stunningly clear. The clouds were very high and sparse, and there was a pronounced northerly component to the wind direction. I thought we might have a bay crossing in the bag. Or at least half in the bag! 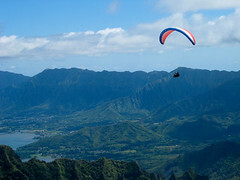 Five of us enjoyed a great afternoon of flying at Kahana today in brisk north conditions. We flew all around the north face of the ridge, and many bay crossings were attempted with various levels of success: Scot made it across on his first try in his spanky new Synergizer, but I needed a few attempts before I could follow him under my tired old nag. I finally joined him over there for an extended high altitude tour of Ka'a'awa and Kualoa. The clouds were super high and sparse, and the brisk northerly flow pushed us higher than usual without much effort on our parts. We were treated to a clear tantalizing vista of the whole Ko'olau range - on a lighter day we would have been obligated to shoot for Makapuu. Brazilian Ray made it across to the Crouching Lion while we were over there, and worked hard to get up, but he got spooked by some strong sinky airflow in the bowl over there and bailed back to Kahana. Mad Dog (fresh off the plane from his 6 week mainland motorbike tour) and One-eye Jim also flew for quite a while over there. Poor McStalker had intended to join us but got stuck in a massive traffic jam on the west side and decided to turn back. Next time! Thanks to Scot for the tasty cold refreshments. I forgot the memory card for my camera so I guess the images of that crystal clear landscape and sky will have to remain imprinted on my brain - unless I can convince Scot to share any of the shots I saw him taking up there, in which case I'll post them here.